“Nightmare” was the word I kept hearing from passerby walking up the hill toward the Natural History Museum. The streets on both sides were filled with cars, and that was one steep hill away from the actual parking lot. This is a predicament I’ve been through at big concerts and IPhone release events, but never situations with the word “cheese” in it. 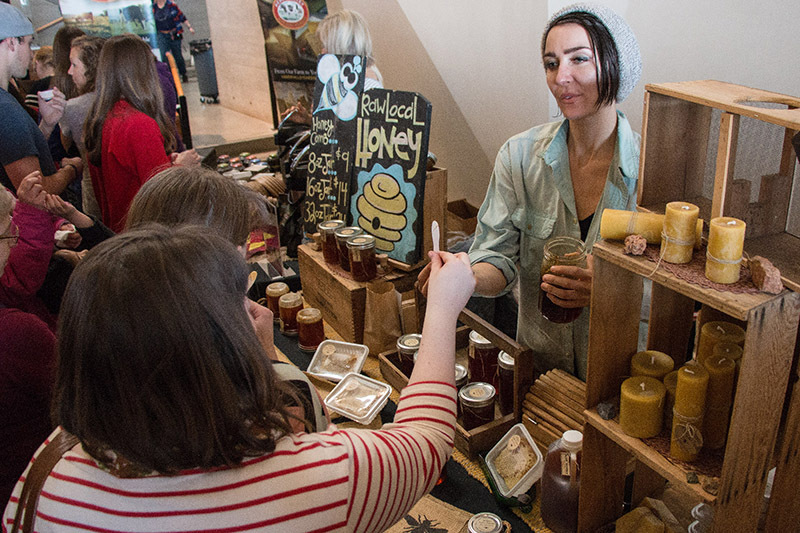 This day at Utah’s Chocolate and Cheese Festival was the biggest thing happening in Salt Lake City at the moment, and rain and snow didn’t faze the attendees in the slightest. 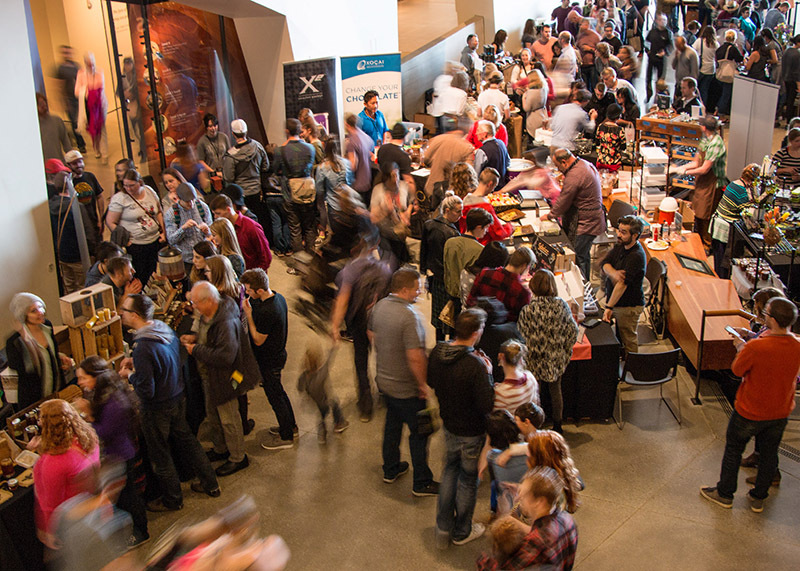 I thought “nightmare” was a harsh choice of words, but then I had to wait 432 seconds for one of Kasthuri’s incredible cupcakes, and I understood the harsh reality: 26 of the most delicious vendors in the world were surrounded by Utah’s best connoisseurs. The turnout was so strong, the doors had to be closed after five hours because the building was at capacity. 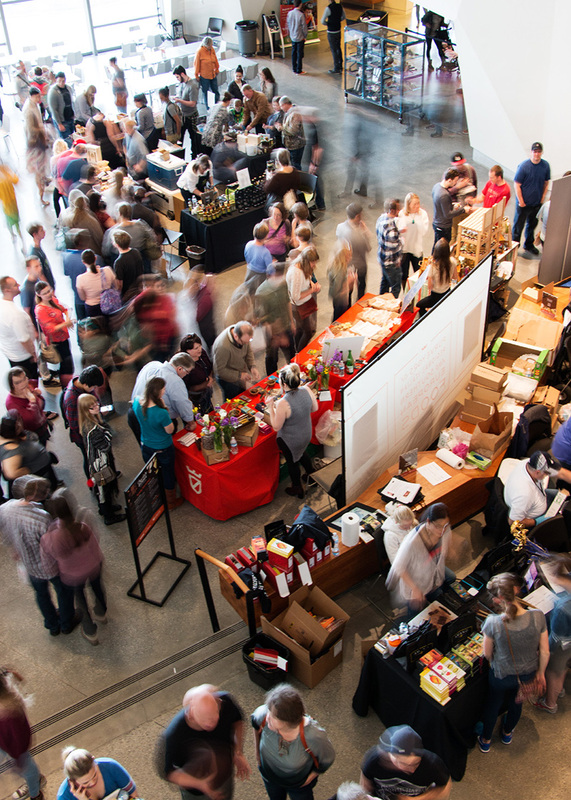 No one could have predicted this level of growth from last year’s event. The funny thing about human nature is our ability to create organization out of chaos. All the different vendor booths were designed for casual wanderings and toothpick stabbings of chocolate and cheese. Somehow to the amazement of myself and Patty, the event head honcho, people created giant lines leading to food in most cases, but sometimes only leading to more lines. 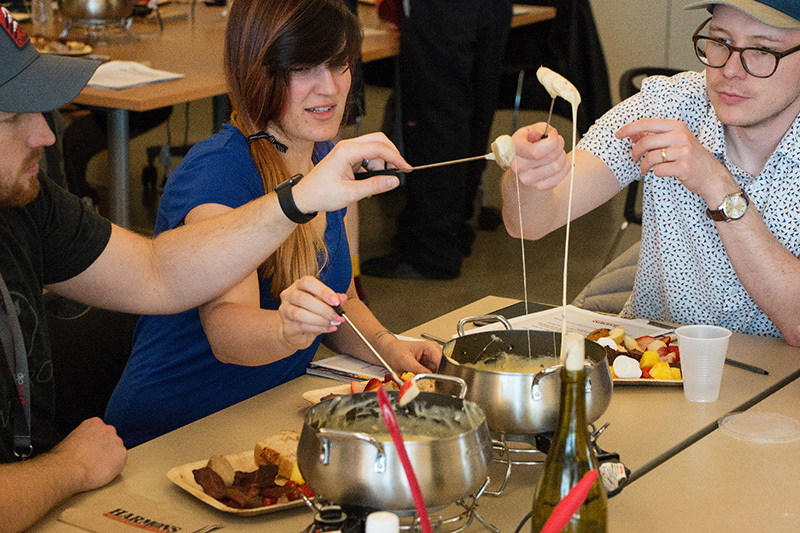 If I were to sample all these fine wares, I had to become … a chocolate and cheese ninja. I first witnessed these ninjas shooting between the lines as I took in the multiple-floor event. I admired their bravery, so I grabbed a toothpick and dove into dark chocolate, sharp cheese, caramel, chili oil, olive oil, coffee, honey and jam. That’s right: The Chocolate and Cheese Festival is further enhanced by all sorts of non-dairy alternatives. There was even a chocolate dinosaur fossil sculpture that so intensely replicated source material that I thought I had strolled into the non-festival portion of the museum. Pacing is important when consuming bulk dairy, so the museum and festival workshops were excellent munchie alternatives. 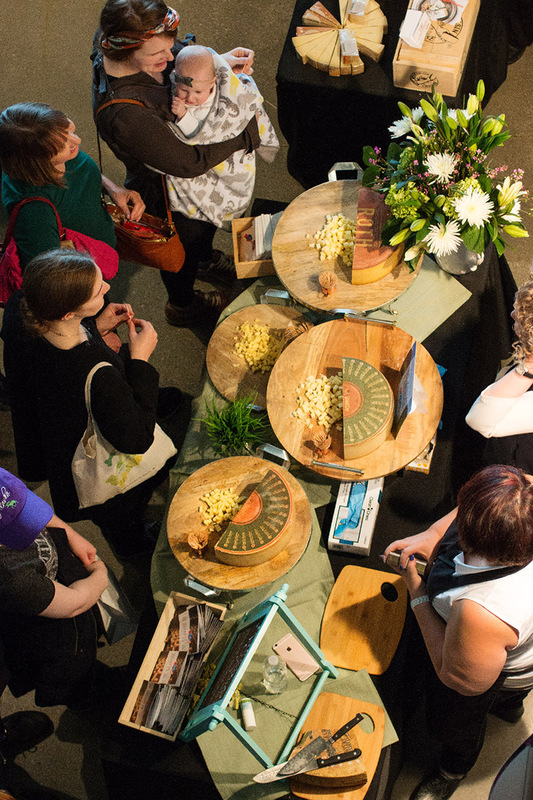 Workshops ranged from chocolate secrets to bizarre foods onto which you can apply your cheese and chocolate. I had already filled my man purse with several cheeses, so I was eager to learn some tricks of the trade for brie and swiss. The following day, my wife dazzled my friends with a Portobello mushroom, spinach and peppered sharp cheese sandwich that could stop traffic. I even set out toothpicks to imitate the festival (oddly enough, they still formed lines as well). There were differing methods of food distribution at the festival. Some vendors used tongs and some let the patrons use their own hands. This made food ninja’ing easy, but did remind me of the peanut bowls of bars past. The patrons were aggressive during this process (who could blame them? ), and I hadn’t been bumped that much since taking salsa lessons with my mom in the land of the late ’90s. Another point of note were the amount of toothpicks dropped and the lack of water access, but my Donkey Kong background with rolling logs quickly negated this, and even though bottled water was scarce, fountains were available at the bathrooms. On a lighter note, this was the most thoughtful crowd I’d ever been around. Attendees would take a bite, arch their heads back and assume the most thoughtful expressions I’d ever seen. There was also a geeky element to the festival, as several sub-groups formed to the side and had the most elaborate cheese chats I’ve ever heard. The staff of NHMU was incredible at answering my random questions, and one particular staff member named Carson was both helpful and very funny at the same time. 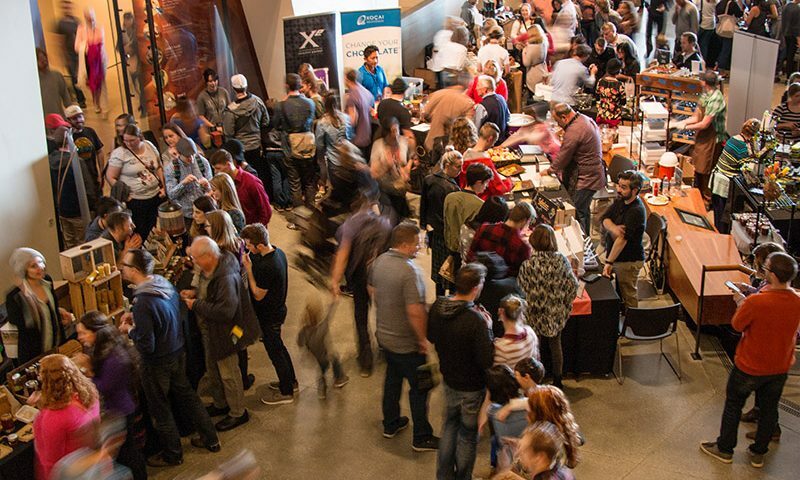 Next year, I imagine the festival will be a similar success too, so to all that wish to attend, I suggest you brush up on your palate, keep an open mind and let Utah’s finest vendors challenge the world of chocolate and cheese as you know it.